Compact, handy, robust manual tacker. Very powerful. Maximum driving power with minimum effort. 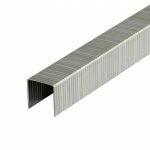 Two different types of staples (2 in 1) are used in the same tacker with no need for adjustment. Bottom loading.